Sometimes it’s hard to justify the high price tag of some of these high-tech products. They often seem like gimmicks. But the Genius 9000 uses its tech features to improve its cleaning performance and make it easier to use. The Oral-B genius 9000 is what I’d call a supercharged toothbrush. It is not a cheap electric toothbrush but it’s packed full of so many features that it’s irresistible. It boasts of things like position detection (using a camera! ), six cleaning modes, four extra heads and a smart carrying case. It even has Bluetooth. 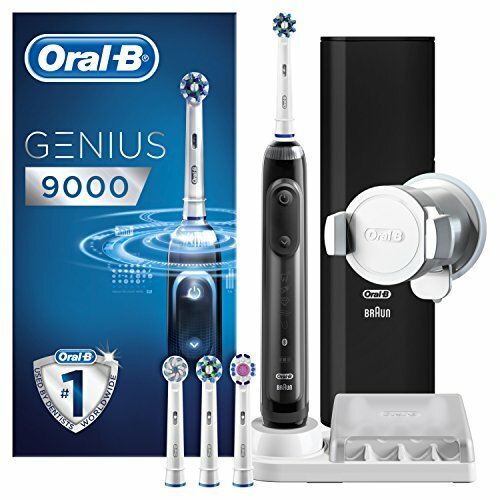 If you are looking for a high performance electric toothbrush to replace your current one, I highly recommend the Oral-B Genius 9000. 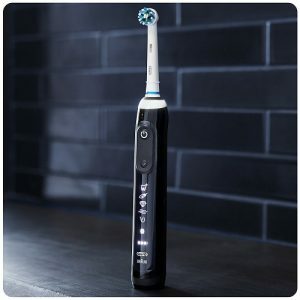 It will cost you more than most other electric toothbrushes but it will also reward you in many more ways. See its full features below. Daily clean – the basic everyday cleaning mode. Pro-clean – for a deeper more thorough cleaning. Sensitive – uses a gentler brushing motion. It’s ideal for those with sensitive teeth and gums. Whitening – reduces or eliminates the appearance of stains on teeth. Ideal for former tobacco users or frequent coffee drinkers. Gum massage – gently massages the gum to improve blood flow. Tongue cleaning – there is more debris on your tongue than you realize. This mode helps get rid of it, which can help improve you dental health and reduce bad breath. With 4 extra brush heads you are saved the hustle and costs of buying extra ones for a year or two. Each brush head is slightly different to allow you to pick the one that best suits your needs. There’s one with extra-thin bristles for sensitive teeth and another that mimics the action of flossing by reaching deep down between your teeth. This is one of the star attractions of the Genius 9000. The brush is fitted with a front facing camera that allows it to monitor how well you are brushing and detect the current brush position. When connected with the smartphone app (yes, it has an app), it can alert you when you have missed a spot and guide you on how to brush more effectively. Even if you just use it for a few days before it gets old, at least it will help you form a good brushing habit. Another star attraction is the Bluetooth connectivity. The brush can connect wirelessly to an accompanying app on your smartphone. When connected, the camera on the brush relays images and position to the app which then guides you on how to cover every spot. The app also functions as a timer, ensuring that you brush for at least the recommended 2 minutes. This is yet another high tech feature that makes the Genius 9000 easier and more fun to use. The LED SmartRing is located at the top of the handle and comes with 12 colour options. The SmartRing lights up in a specific colour if you brush too hard which could damage your teeth and gums. Different colours are also used to indicate which brushing mode is currently active. Despite the high tech nature of the Genius 9000, it is really easy to use. Whether you are changing the brush heads or switching from one mode to another, it’s all straightforward. The only feature you might take some time to get used to is the app, though it doesn’t take long to know your way around it. Apart from the four brush heads, the Genius 9000 comes with a smart dual charging travel and a 2-pin UK plug. These are all you need to start using and travelling with the Genius 9000 toothbrush. The app requires some time to get used to it. If you hit the road often, you will be glad you got the Oral-B Genius 9000 toothbrush. It is one of the most travel-friendly electric toothbrushes. For one there is the long lasting battery. On just a single charge, the lithium-ion battery can last 12 days, enough for most of your business travel and camping trips. If you will be on the road for longer, carry the smart travel case that can charge both the brush and your phone. Nicky is an editor-in-chief at Dental Care Club. She is a mum of three and lives in London with her family. She enjoys writing about dental care and her morning yoga sessions.